All about Mould in Rented Property. What to do, if you found Mould in Rented Property? Babies & children,elderly people,those with existing skin problems, such as eczema,those with respiratory problems, such as allergies and asthma,those with a weakened immune system should stay away from damp and mould. If your rented property has mould you will need to alert your landlord in writing as soon as you notice a problem to prevent any further damage. Make a note of any conversations you have with your landlord in person or on the phone. Follow up your conversation with a letter confirming what was said and agreed. Keep a copy of your letter and send it to your landlord by recorded delivery. (This will help later if there are any arguments over when the repairs where reported). Ask your landlord if you don’t know their address. You have a legal right to know this. Allow a reasonable time for them to be fixed. The time needed depends on the urgency of the problem. If the landlord does nothing, you could send another letter, telling your landlord that you will ask your local council’s environmental health department to inspect your home for hazards. Please keep all proofs of issues mould has caused you – clothes which have mould, pictures of affected areas, doctor’s visits for mould related conditions, etc. If there is no action by the landlord the you can report the problem to environmental health department, an officer should come to inspect your home. If they decide that your home includes a serious hazard, they have to take action. For less serious problems they may choose not to take action in which case you may choose to take Landlord to court. 1) Keeping internal doors closed when showering or cooking, to prevent damp air from spreading through the house. 2) Dealing with any damp and condensation in your home, maintain ideal indoor temperature of 19-22⁰C and indoor humidity is 30-50%. You can measure humidity with a humidity meter purchased from your local hardware store or online. Maintaining this level of humidity can be challenging whilst expensive extractor fans (also referred as condensation control systems) are long term solutions dehumidifiers offers a quick fix. Dehumidifiers most likely involves regularly changing water compartment, some noise levels and electricity consumption of around £21* per month. You may consider to invest in a dehumidifier which has auto shut off to save energy. 3) Avoid drying washing indoors or on radiators. Drying washing indoors can release up to 2 litres of water in the room and increase humidity by 30%. You may consider investing in a tumble drier or a dry buddy. 4) Improve Air flow in your house and dry/treat affected areas immediately. It sometimes comes down to very small details. 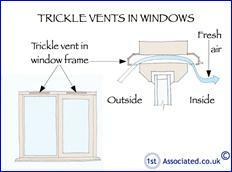 Some properties in the UK have been retrofitted/constructed with low-quality double glazing, lacking key ‘trickle vents’ that enable some movement of air. 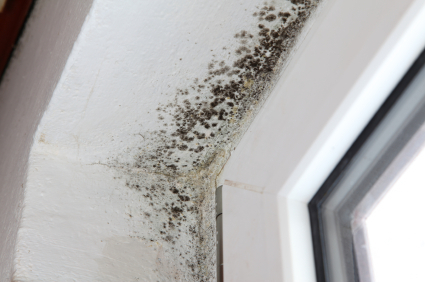 Most of the time mould is caused by condensation. Excess moisture indoors can be caused by condensation. Condensation forms when the air indoors cannot hold any more moisture. This can be caused by cooking, showering, drying clothes indoors and by human breath. Droplets can form on indoor surfaces such as mirrors, windowsills and on walls, particularly when they are cold. Condensation can be worse if rooms are poorly ventilated. Mould is recognised as a potential health hazard and mould growth within the indoor environment has long been linked with poor health and property damage. The risk of this is assessed according exposure time, species and quantity. Mould spores are the most significant bio-pollutant of the indoor environment. As a company that deals with mould removal, you can’t remove all the bacteria and mould spores with just using bleach and water. The best way is call a professional firm which will remove and kill all bacteria from your walls and ceiling also around window frames and to stop it from spreading further. My landlord did a bad fix in my baths causing the toilet to leak . this caused a spreading /growing mould . that was there for two months with a 4 year old in the house , because this mould was in the bathroom environmental healths response was “it is cosmetic . it is not in a living room or bedroom , it isn’t a health risk” so yeah , . good luck with them if you have mould and children . luckily after the 2 months the floor was taken up and landlord finally got some lino for me to put down . With regards to allergies etc get a dehumidifier with an ioniser. Breathing becomes difficult when there are an excess number of positive ions in the air. An ioniser attaches negative ions to positive ions (such as dust, pollen, mould etc) and pulls the enlarged ion down to the floor or into the dehumidifier filter. This makes breathing much easier. For added freshness get an anti-bacterial filter as well. As a landlord myself I find that lots of tenants dry clothes inside during winter. By drying clothes indoors the relative humidity level can rise by up to 30% creating an ideal breeding ground for Aspergillus Fumigatus spores which can cause permanent respiratory damage. By using a dehumidifier with a laundry mode feature this problem can be over come. If you want to get rid of black mould of tile grout or the sillicone around the bath just buy a bottle of HG Mould spray. Simply spray, leave for 15 minutes and hose off with the shower. Magic! No more scrubbing with a toothbrush. Mold growth in rented house can be a trouble for the landowner. There are various instances of financial penalty imposed on landlord for delay in treatment of mold growth that caused serious health issues to their tenant. So if you do not want to put yourself in similar situation immediately contact black mold removal service in Nassau County New York for its quick removal. It can protect you from the legal proceedings of tenants and can also save your property from its influence.